Stem cells possess the unique ability to generate a large spectrum of different cell types despite retaining an undifferentiated phenotype themselves. This property of stem cells is mainly due to their ability to divide asymmetrically. An asymmetric cell division generates two different daughter cells. In general, one daughter cell has a restricted developmental potential and will give rise to terminally differentiated cell types after one or more additional cell divisions. In contrast, the other daughter cell retains its stem cell character and its ability to divide asymmetrically. By this mechanism the stem cell population in the organism is maintained and can serve as a continuous source for the generation of differentiated cell types. We have shown that the evolutionarily conserved Par-3/Par-6/aPKC complex has a key function in the molecular control of asymmetric cell divisions. In particular, this protein complex controls the polarization of neural stem cells, which is required for the asymmetric localization of cell fate determinants, the proper orientation of the mitotic spindle and the unequal size of the two daughter cells. In order to uncover the mechanisms of how the Par-3/Par-6/aPKC complex interacts with the plasma membrane, the cytoskeleton and the mitotic spindle, we have performed protein-protein interaction screens (yeast two-hybrid screens) using different regions of Bazooka/Par-3 (Baz) as bait. These screens led to the identification of several interaction partners whose function in the asymmetric division of stem cells is currently under investigation. In a second approach, we investigate which genes are responsible for maintenance of the stem cell fate or for initiation of the differentiation process. To that aim we study the transciptomes of different types of stem cells in Drosophila by next generation RNA sequencing (RNAseq) and compare them to transcriptomes of differentiated cells derived from these stem cells. Subsequently, differentially expressed candidate genes are functionally tested by RNA interference and the use of state-of-the-art genetic methods. Candidate genes from these screens are currently being characterized at the phenotypic level and will be further investigated to unravel their molecular function. Image 1. Drosophila neural stem cells called neuroblasts divide asymmetrically to generate another neuroblast and a ganglion mother cell. 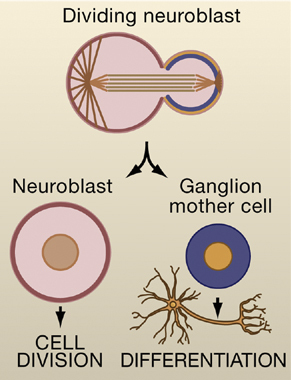 The ganglion mother cell will divide once more to generate a pair of differentiated neurons or glia cells, whereas the neuroblast will continue to divide in an asymmetric fashion. Image taken from Wodarz and Gonzalez (2006) Cell 124,1121. Image 2. 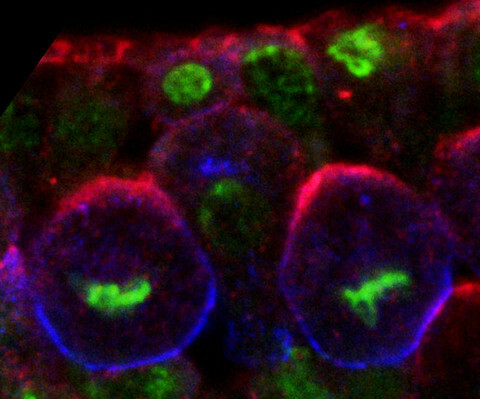 Two dividing Drosophila neuroblasts in metaphase were labeled for Bazooka/Par3 (red), Miranda (blue) and DNA (green). Bazooka marks the apical pole and Miranda the basal pole of the asymmetrically dividing neural stem cells.